On March 15, with the advent of spring and despite the previous day of rain, Karen and I decided to venture out onto the Appalachian Trail. It wasn’t as muddy as one might have supposed; it was mucky in patches but never swallow-your-boots muddy. 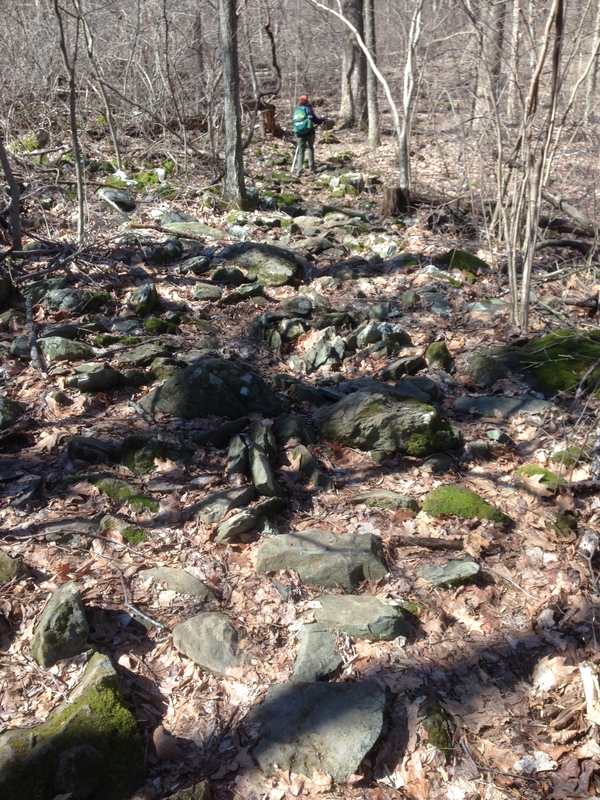 There were also a few patches of ice, vestiges of winter, off to the side of the trail. The weather was accommodating, with a high in the mid-50s and gusty winds. Threatening clouds gathered in the morning, which suggested to us that we might have been more prepared, despite the assurances of meteorologists. Even so, it proved to be a beautiful day for hiking. We could hear a few birds, but it would appear that most had not yet returned north. For the most part, we heard the crunch of dead leaves beneath our feet and, in a few places, the running of a creek. We crossed that creek twice, and we had to be careful of our footing on the rocks, as it was certainly deep enough to cover our boots and then some. We had brought spare socks just in case. 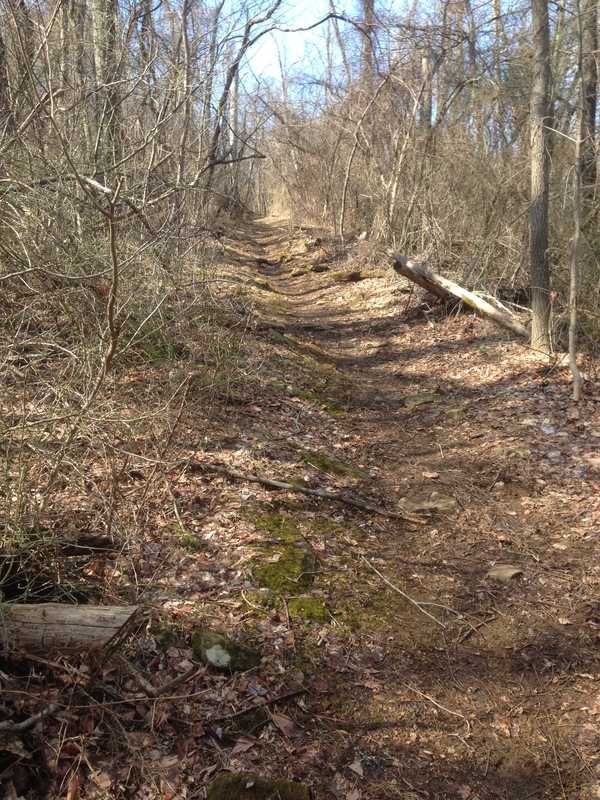 Going southward, from about a mile northeast of Linden, our hike began with an ascent of 600 feet. It wasn’t by any means daunting, but was rigorous enough to let us know that we had gotten a bit out of shape during the winter. With the trees still bare, Karen and I could sometimes see valleys and mountains that would otherwise have been hidden. Near the top of this first ascent, we could look back through the trees and see I-66 in the distance. Before we reached the Jim and Molly Denton Shelter, we met a northbound thru-hiker who claimed to have begun his journey in January. Given the snow we’ve had this past winter, Karen and I were both a little incredulous, but he assured us that he was quite insane–when it came to hiking, that is. We stopped at the Denton Shelter for lunch, and I have it from a credible source that the privy there is not only remarkably clean but even pretty. 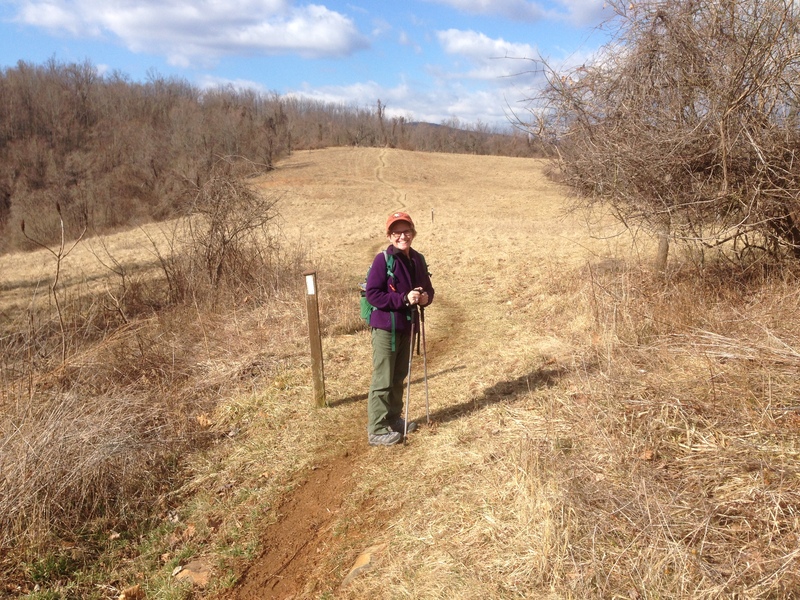 This entry was posted in Birch's Jots on Jaunts, Virginia Hikes and tagged Appalachian Trail, day hikes, Virginia by Birch. Bookmark the permalink. 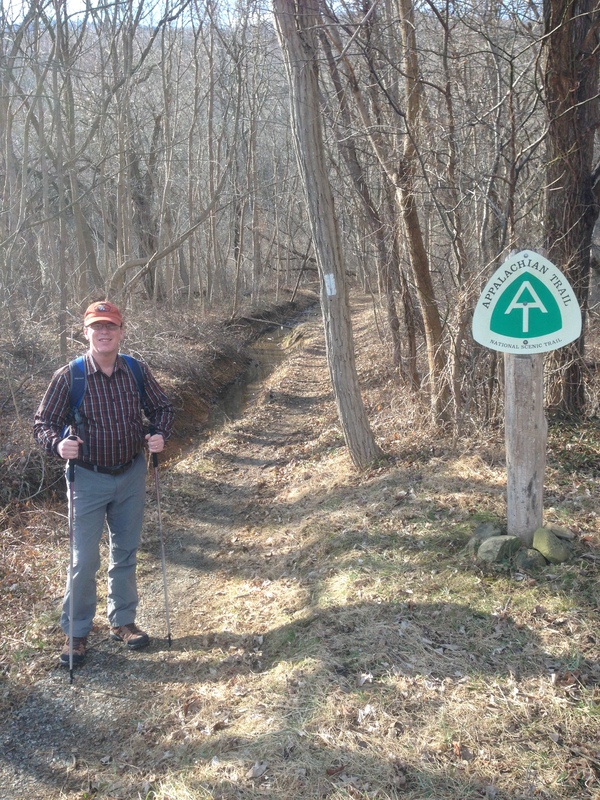 After much hiking in my youth (Boy Scouts, working at Grand Canyon, and Army Infantry) and a long hiatus from the trails, I picked up my trekking poles again in 2014 at the age of 53. I'm having a blast! . . . But, alas, so many trails, and so little time. The trail is looking nice! Makes me miss it!